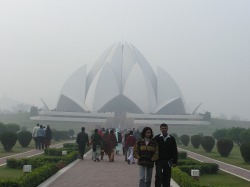 (Raj) Ashok, Sudesh and Raj finally made it from Mumbai to fog-bound Delhi. Samji was already there as he had been touring Buddhist sites of importance and Kolkata for some weeks earlier. Now we waited for Saif who was arriving by bus from Lahore. He had also been in Pakistan visiting relatives with his family. His arrival that night seemed touch and go. 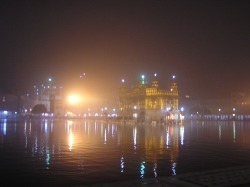 The three Ulloos arriving from Mumbai were picked up by a taxi driver sent by Samji. He told them "the traffic in the Punjab has come to a stand-still due to the fog". "Did you not know?" He asked. Well we thought Saif would for sure be delayed until the next day. But to all our surprise he arrived about 8 p.m. and was met by Samji. Thanks to the vision of the Prime Minister Mr Atal Bihari Vajpayee a bus connection linking Delhi with Lahore had been made possible. So here is Saif being welcomed to India with a not too massive a bouquet of flowers. (We would like to thank Pepsi for providing the flower vase). All together for a change - off we go guys! (Raj) It is not every time that all five Ulloos get to travel together. 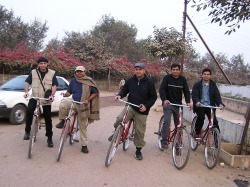 Some times just three (Saif, Samji, Raj), mostly four with Sudesh joining them but on rare occasions all five manage with Ashok completing the set. So here we are all five in India. And this made it an even more incredible visit than had not all of us been able to do it together. (Raj) Some have come in the Name of God to save humanity from sin. The Buddha came to save mankind from suffering. Desire, he thought, leads to suffering. Suffering is overcome when desire is conquered. The next day, after we all met in Delhi, we took off for Varanasi. And so began our journey across northern India. 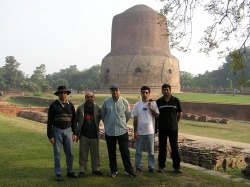 Not far from Varanasi, in the nearby town of Sarnath is the Deer Park with its large stupa. Sidharatha Gautama attained enlightenment in what is now Bodhgaya and he, now as the Buddha - the Enlightnened One, preached his first sermon here. This peaceful site is revered by the Buddhists. 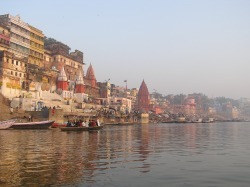 (Raj) Varanasi, the foremost holy city of the Hindu faith, is a fascinating place. We were all captivated by it in one way or other. Words are not enough to capture the atmosphere, the mood and the experience. One has to go there to to absorb, feel and sense it all. It is ancient in its spiritual esteem but actually not that old as far as its buildings and architecture goes - having been destroyed and re-built over centuries. Yet, I'm sure nothing has conquered, diminished, or tarnished its spirit even through the turmoil. Alive today as it ever has been through time immemorial. (Raj) There we were, on our first evening in the Holy City of Varanasi. The Ulloos made their way to the river with our much learned guide who we began to admire for his knowledge and passionate devotion to his city, the god Shiva, and the Holy Mother Ganga. When She came into site She looked like any river would look. Really a bit like my first sight of the Thames as a child back at home. Somewhat murky, gently flowing but with a lot of activity on the bank - on the Ghats to be precise. At the Dasasmavedh Ghat we stopped and looked on in silence. Thanks to Samji he had already planned a pre-dawn boat ride for us the next morning. And so we were on the river before sunrise the next day. Already there was plenty of activity underway on the Ghats. Prayer chants by priests and devotees, a lone flute player, a Japanese woman deep in meditation, Sadhus and people bathing. A lone swimmer almost half way into the flow. All wonderful really. 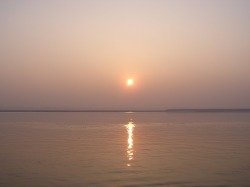 As the sun rose we came ashore on the Dasasmavedh Ghat and I had it in my mind to take an "ishnan". An immersion - not expecting anything but keeping an open mind just in case. The Ulloos were disappointing as they refused to join me (fearing pollution I guess). So I changed into something suitable and the guide asked me to leave my clothes with a priest who sat by on a wooden platform. I was about to enter when Samji shouted "No! Raj you have to do it properly!" While the guide shouted "Sir! please take of your flip flops!". It is a very holy river after all and who am I to go in so disrespectfully? Samji told me to recite the Gyatri - the Sanskrit prayer to the sun. Did he expect me, a non-Hindu, to know the Gyatri? Dhiyo yo nah prachodayat. Om!" Om! Oh Creator of the Universe! We meditate upon Thy supreme splendour. May Thy radiant power illuminate our intellects, destroy our sins, and guide us in the right direction. Om! Our good guide joined in. A small crowd of curious on-lookers gathered to watch this spectacle being performed by a foreigner. Not noticing, and concentrating on my words, the Ulloos later told me about the sheer joy on the face of the guide and that of surprise on the on-lookers'. Having said my prayer it was time to meet the Holy Ganga. Expecting the Ghat's marble steps to be slippery with slime, or worse, and fearing an embarrassing mishap, I stepped gingerly down into the water. To my surprise the steps were quite clean. So there I was chest deep into the somewhat tepid water and, with cupped hands, poured some over my head. I thought the job was done but Samji had not finished with his instructions! "Do it PROPERLY! Go in and take three dips under the surface!". I thought it a joke but did as he commanded. Having finished I came out and the guide asked me to give the holy man, sitting besides my clothes on the wooden platform, a single Rupee note. This I did and the holy one took a pinch of vermillion and saffron powder and, while I closed my eyes, placed it as a tilak mark on my forehead. Hands folded, I bowed in respect and got changed back into my clothes. Well, what can I say? I had gone in expecting nothing to happen and suddenly experienced that something actually had. It grabbed me and my mind went numb with peace! I could not put it into words. I was silent. Samji said that now I was a nominal Hindu for the day, cleansed of my sins, and those who would touch me would likewise become cleansed of theirs'! Wow, it was great being saviour even if for a day! Be careful with that lamp! (Raj) We went to the Ganga one evening and watched Brahmin priests perform Aaarti to the Holy Mother. Our guide took us to the rooftop of a cafe from where we saw it proceed. "This observing point is only for tourists" he told us, as if we were privileged. And sure enough there were visitors from many parts of the world including two orthodox Ashkanazi Jews. I looked at them and wondered what they must have thought of it. India is truly a Holy Land, just like theirs. It has given birth to four of the major world religions - Hindu, Buddh, Jain and Sikh and countless sects and sub-sects. Furthermore it is home to Muslims, Christians, Zoroashtrians (Pharsees), Jews and Bahais. 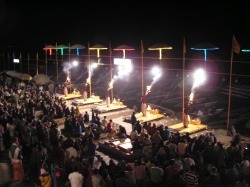 The Aarti to the Ganga lasted about an hour. Not only to the Ganga but offering blessings to the world in all four directions. (Raj) The third great Mughal Emperor Akbar longed for a son. An heir to take over when he would would no longer walk upon the good earth. Desperate for a miracle he went to the Sufi Pir Salim of the Chishti order. Long famed for their spirituality. The Pir told him he would indeed have a son. And so it was. When Akbar built his palace complex, from red sandstone, at Fatehpur Sikri near Agra he built a small exquisite marble shrine for the Pir once he passed away. In the picture taken at the time, you can see it clearly outstanding in white amidst the red surroundings. Such places are called "Dargah" and, in India, people from all faiths visit them. They are places where the often solid boundaries between faiths dissolve into nothing. And so it is here. Much more so for couples who either lack offspring or those who long for a son to join his sisters. But majority come to pay their respects. We arrived and stood looking at it in the distance from the shelter of the entrance. The combination of a few things conspired against us. One was that our driver was pushed for time and wanted us to leave for Jaipur - a long drive. Another that he told us if we left our shoes with the official shoe-keepers they would keep them and demand extortionate bribes in order for us to have them back. But it was also a miserable, cold and wet day. Who was prepared to remove their shoes and socks to walk over the cold wet stones to get to the shrine? No one it seemed. The guilt of it only dawned on us later and shook our conscience. Perhaps we shall make up for it another day, on another visit - Inshah Allaha! (I had the good fortune of having been taken there by my father when I was five year old in 1963 and the grandeur, beauty, size and majesty of the whole place had left a lasting impression). (Raj) You may have seen the Taj Mahal shimmering majestically white on a bright sunny day. You may have watched it soften and turn moody in the gentle glow of the setting sun. You may even have seen it romantic under the soft light of a full winter moon. But now you see it in the fog. Or rather you don't see it at all. 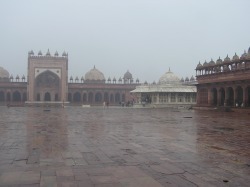 This totally grey picture was taken from the Laal Qila (The Red Fort) looking towards the Taj. It is from where its builder Emperor Shah Jahan would have looked on with fond memories of his favourite wife Mumtaz Mahal who lay buried there. On a clear day the Taj is visible in the distance, by the bank of the river Jamuna, resembling a delicate miniature model. 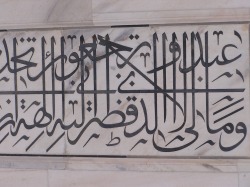 (Raj) Beautiful calligraphy, set in marble, depicting Verses from the Holy Qaran adorns the Taj. Which reminds me. As we have traveled through many countries we have not really been able to master some of the languages.... well we are all scientists or engineers and such things do not come easily to us. Of Turkish and Arabic (in Morocco, Egypt, Syria, Jordan, Lebanon) we could but only use the greeting "asalam ulaikum" and "shukran!" "thank you". But at least Saif and I know a few more words and can read it, which helps. But it was in India where we really excelled. Of course most of the people we came across spoke English - but that was the easy way out. One of our drivers however claimed not to know any English despite the fact that he had told us he took foreigners on tours for days. We took it with a pinch of "nimak". Well maybe that was his way of telling us to use his national language - Hindi. Saif and I speak it and also Urdu, which is close but leans more heavily on Arabic and Farsi vocabulary and has the same grammar as Hindi. So that is what we used. Samji, who also speaks Gujarati, and before/during the visit had developed a good grasp of the language and used it to effect. Saif, Sudesh and I also speak Punjabi and Ashok speaks...well a kind of Gujarati (so I've been told). Our driver, from Rajasthan it so happened, also spoke Punjabi and complemented Saif on the command and purity of his grasp. I am not as proficient in Punjabi, and even less so in Hindi, as I have to think of what I have to say first in English, have it translated by the multilingual professor in my head, before the words come out. At times I have failed to take this route and caused amusement to say the least! Hence, unless compelled to do so, I stick with English when I'm in India. When we visited Spain Samji and I took the effort to self-teach us Spanish and, at the basic level, it actually worked. In Morocco Sudesh used French quite effectively and at times in a joint effort with myself. Come to think of it I began very well at school but soon lost all interest (largely due to a teacher who was more addicted to France and red wine than the language). But sometimes given a little effort it returns at a very basic level - like "Bonjour!". 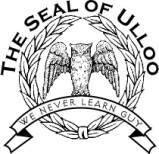 In Turkey (we'll tell you more about our encounter with a lawyer and his farmer friends on the Turkey page) I communicated in basic German and translated it back into English for the Ulloos. These days my German is not so cleaver (nicht so Gut!) . Use it or lose it as they say. But it does come back when I'm over in Germany - which is quite often. 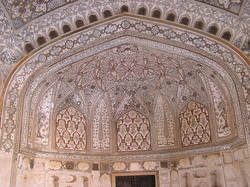 (Raj) We do not normally organise or plan our Ulloo trips to the degree that, thanks to Samiji, we had done in India. It made great sense as traveling free-style in India needs a lot of time and patience. But Samji had it all singed and sealed before we arrived. Plane, train, hotels, drivers and guides with a well planned agenda to get us all through it on time. It could not have gone better. Many who have not been there in winter imagine India to be a hot place, if not approaching "furnace" category. Yes, it can be like that during the high heat of the summer. But, northern India can get quite cold in the winter.  As cold as any western European country but also foggier. So the December of 2003 when we visited was close to freezing in the mornings and at night. Heaters were on in the hotels and we wore a few layers of clothes during the day to keep out the chill. But I had lost my jacket somewhere on the way by plane from Delhi to Varanasi and felt the cold most acutely. Time to do something about it in a slightly warmer Rajasthan before we headed north to the freezing Punjab via a wintery Delhi. Time to ask the driver where to get a decent Jacket! So one evening he took us to buy one. I looked about and found a Rajasthani quilted jacked. Perfect in style! I thought but it was garish in colour and not something to be seen in on a street in London. I asked the shop attendant if he had one in black. No he did not but would make one if I so desired. "But we will leave tomorrow for Delhi" I said. "What time?" he asked. "At eight in the morning" I told him. "No problem, sir we can deliver it by seven". So we agreed and he took my measurements. Meanwhile the driver was also trying on some local attire (as shown). He told the attendant he was originally from Rajasthan but had lived in Delhi for some time. "So why don't you take and ware these clothes in Delhi?" The driver responded "I'd be a laughing stock if I did that in the street!" As we were about to leave the attendant showed me that my jacket was being put together already. "Finest cotton filling sir! You will have at seven in the morning". Outside the driver remarked "That means by eleven in the morning!" As promised I got my jacket exactly on time and it was time to head off to Delhi. (Raj) It was Christmas Eve the day we arrived and while we were having dinner there was something going on at in the reception lobby of the hotel. There was laughter followed by singing. We dropped our chapatis and went to see what all the commotion was about. There was a group of people comprising young girls and boys, their mothers and a nun. All Christians from the state of Karela, as we subsequently learnt, and here to sing Christmas carols by the hotel lobby Christmas tree and welcome the manager, a smartly dressed Sikh gentleman and his equally well turned out wife to the Christmas Midnight Mass. A young boy was dressed as Father Christmas and the delightful nun who was in charge invited us along too. So at about 11.00 p.m. we called a taxi and went to mass held in their delightful little church. The service was conducted by a priest in their Karelan language which we did not understand. In the morning while the Ulloos were finishing their breakfast I went to see our driver who, in the hotel car park, was making his vehicle ready for us. He seemed rather quiet and slow at conversation and finally said "Sir, I hear you went to the church last night and took a taxi". Well yes and I said that since after a long drive the day before he had gone to bed early we did not want to disturb him. Clearly he was not pleased and replied "But Sir, I am your driver and you should have woken me up! I am supposed to take you everywhere!" I was lost for words. 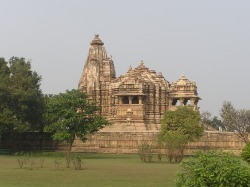 (Raj) The temple builders of Khajuraho must have engaged in some sort of competition to out perform one another. I can imagine their imagination running riot to create what must be one of the world's most beguiling sites. Not palaces but temples - not for worship but show. Here is an exuberant disply of gods, goddesses and humanity in all it's colours (oh and a few postures). For me the art is fantastic. I can just visualize a sculptor having worked on an image before its placement but having it under a white sheet at first to present to his patron and colleagues. "Voala! Now what do you think of this....henh? Think you can do better?" (Raj) This picture is not of the clock that does not tick but one of a number of rather enormous astronomical instruments installed by the great Maharaja Jai Singh of Jaipur, now in Rajasthan. 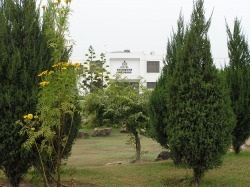 It is a complex close by his palace. He was a patron of the sciences. 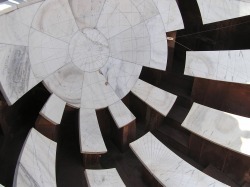 This photo is of a large concave instrument that predicts the position of the sun and the stars at any given time of the year (not just astronomy but astrology was also of importance to the good monarch). I was taken in by its geometric appeal - quite an aesthetic creation, so I took the image close up. The clock that does not tick but is perfect at telling the time to the second (that is if your watch is set to Indian Standard Time - IST) is a gigantic sun dial, biggest in the world, that visitors are still allowed to climb up (although this is not necessary to tell the time when the sun is shining as it can be read at the base). But at least it offers a good view of the Maharaja's palace. Our guide pointed to his watch to follow the shadow cast by the sun passing over the dial to demonstrate the accuracy - to the second! And so it was! I hope his watch was correct and synchronised with IST since us Ulloos had no idea what the time was to the hour let alone the second! (no surprises there!). (Raj) This ancient of all cultures, it has to be said, is truly remarkable. Observed with fascination through centuries by visitors from Asia and Europe. It is resilient but not stubborn or arrogant. And so it is absorbing "we expected a solid wall but our cannon ball was captured by paper!" was recorded by one of it's many invaders. India has through the centuries welcomed and absorbed many who have had the need to leave their native lands. Jews who probably were the first arrivals, Zoroashtrians (Pharees) looking for sanctuary, their language and faith from the same original source as the Vedas, many Hindus and Sikhs who crossed the boarder from the newly created state of Pakistan, those from Tibet who wanted to join the Dalai Lama in Dharamsala, those who fled from the creation of Bangladesh and most recently the Bahai. So this is their temple in Delhi that Saif and I visited. 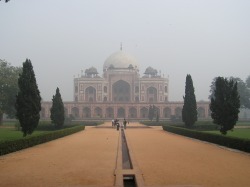 Humyun's tomb is no doubt one of the most wonderful buildings in Delhi. 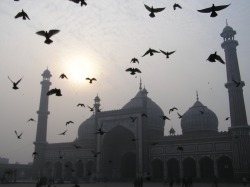 It is said to be one the precursors of the Taj Mahal. Set in red sandstone and marble, it is equally perfect in its grandure, grace and symmetry. Humyun was the son of Barbur and the second Mughal Emperor of India. 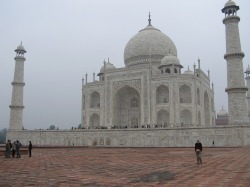 The tomb was built by his wife as opposed to the Taj being built by a husband monarch for his wife. This time just Saif and I visited while the rest of the Ulloos went shopping. I was unsure if I was allowed to join the prayer so I just walked about in the court yard with kids running and laughing all about me. For me it was a wonderful half hour spent just looking about and savouring the atmosphere which was made even more enchanting by the light fog that hung over Delhi and smudged the evening sun into a diffuse disk. Meanwhile, the other three Ulloos were still busy with their shopping....!! 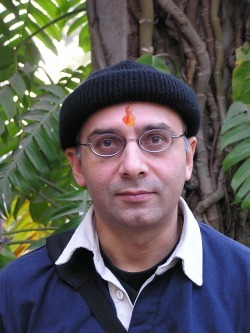 (Raj) We like to visit historic places, interesting cities, museums, ancient ruins and places of worship. 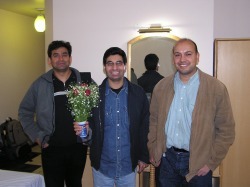 It was New Years Eve of 2004 and we were sitting warm in our hotel room sharing our thoughts and experiences of what we had already seen on our incredible journey through parts of north India. Private celebrations were in full swing at the hotel but alas we were not invited, so we had our own somewhat quiet party. Samji asked me when the prayers commenced at the Golden Temple (known more respectfully as the Siri Har Mandir Sahib - The Honourable Temple of God). I told him I thought at about 4.00 a.m. with the reading from the Sikh Holy Scripture of the morning prayer "Aasa Di Vaar". I would like to go, he responded. OK then you can go! was the response. I informed him he needed to get up at about 3.00 a.m. have a shower and then go. But he responded that he would not go alone but wanted me to accompany him. Out went the long sleep I was looking forward to after our long journey from Delhi that afternoon. So after all the other Ulloos went to bed I sat up in a chair reading a book. In the cold of the morning we stepped outside the hotel to find a bunch of young guys still in party mood with a music system baring out loud Punjabi Bhangra dance music and them in full Bhangra style swing. We walked though empty streets looking for directions to the temple. No such luck. Then, as if out of the blue, driving his rickshaw very slowly up a road, came an elderly Sikh gentleman and stopped when he reached us. Our taxi to the Golden Temple! He asked for fee of ten Rupees (= about 25 Pence) but awarded many times that amount when we got to our destination. The temple, normally thronging with worshipers and visitors, was totally empty. I have been there a few times but had never seen it like this. In the dark shimmering in the electric light, serene as ever but on a very cold morning with a northerly breeze driving through our clothes and flesh to the bone. We sat outside listening to the Asa Di Vaar broadcasted through loudspeakers and echoing about the complex. Beautiful. An hour later, stiff from the cold, we made our way back to the hotel with the intention of returning later together with the rest of the Ulloos.